It’s an interesting concept, an interesting title, that we are water. For water is many things, and often conflicting ones at that: powerful but often uncontainable; clear but sometimes murky; resilient as a liquid but able to shatter as a solid.I’m intrigued by the analogy, but not surprised. Wally Lamb does a magnificent job of portraying characters who embody every quality I can think of as pertaining to water. I began his novel with fervor, enjoying it more than She’s Come Undone and I Know This Much Is True. But, halfway through I bogged down, holding a great resentment toward Annie Oh: the wife, mother and soon to be bride again. She was everything I disdain: selfish, abusive, secretive, lost. I almost abandoned the book, and yet, I’m glad I reached the conclusion where if the reasons as to her behavior aren’t necessarily justified, they are explained. And who am I to judge what her circumstances have made her become? We are each ultimately responsible for the person we evolve into, and some are apparently unable to overcome the wounds of their youth. I liked the way Lamb explored the dynamics of family, the way he took time to give us each character’s point of view, and the dialogue which was spot on. It is a beautifully written book which looks at the sorrows we often endure and how we cope with them. Thanks to TLC Book Tours for the opportunity to review this novel. I do think most of Lamb's book are heavy and full of sorrow but I just love his writing. I was lucky enough to meet him this year and I was totally charmed by him. A new author for me to explore. Thanks for your comments and review. Sounds like a serious but fascinating read…I remember reading She's Come Undone a long time ago…hmmm…perhaps I'll have to try reading Lamb again! Perhaps I'll chase the story with a romantic comedy though. I admire that you kept reading even though you wanted to 'quit'. I've loved all of Lamb's novels, but have been seeing mixed reviews of his latest effort. Glad you stuck with it to share your thoughts with us… I plan to read it soon! I love this author and am about 1/2 way through with this one. It's not going to be my favorite, but I am enjoying most of the characters thus far. How wonderful it must have been to meet him! I love meeting authors whose books I've read. This would be a good book to start with; I Know This Much is True is good, but it is quite long and involved. I really try not to quit the books I've started. For one thing, I don't like all sorts of loose ends. For another, I wonder if I've given the author a fair chance if I don't see it through. This particular ending clarified a lot of reasons why the heroine behaved as she did. I loved both I Know This Much Is True and She's Come Undone, so I'm very anxious to give this one a read. I'm going to hold off until after the holidays, though. I want to be ready to spend some quality time with this book and the next 6 weeks are going to be far too distracting. I'm barely able to read a page or two of nonfiction at bedtime before nodding off. This sounds like a book I could dive into (sorry, I simply could not resist!). As Les says, spending quality time with this book sounds wonderful, but finding the time to do so would be quite a feat right now for me as well. Currently I have more reading material than I can handle, and with the holidays approaching at breakneck speed, I believe my reading “schedule” will slow down considerably. Wonderful review, Bellezza! And I like the simplicity of your new blog design. I might have to add this one to my list. I read She's Come Undone but not the 2nd. Just finished the Burgess Boys by Elizabeth Strout. I enjoyed it. 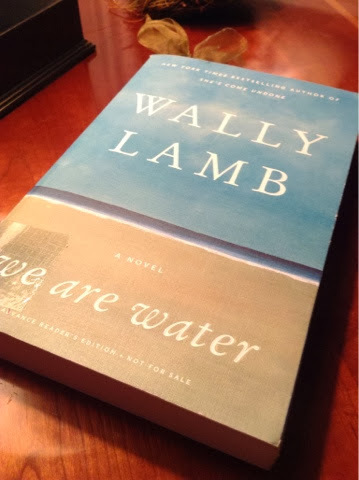 I love Wally Lamb's writing and really enjoyed reading We Are Water. So glad to see that you wound up enjoying the book as well 🙂 I love how you mention that fluidity of humanity – its so true! Great post. And, by the by, I love your new look – very minimalist. The fact that this book had you feeling so strongly about Annie says a great deal about the author's ability to engage readers! I'm glad you enjoyed this one in the end. Thanks for being on the tour. That's one of the things that I wrote in my review too. Wally Lamb has this incredible ability to bring humanity to really terrible people. In this novel in particular, I think he did that with Anna and with her cousin.